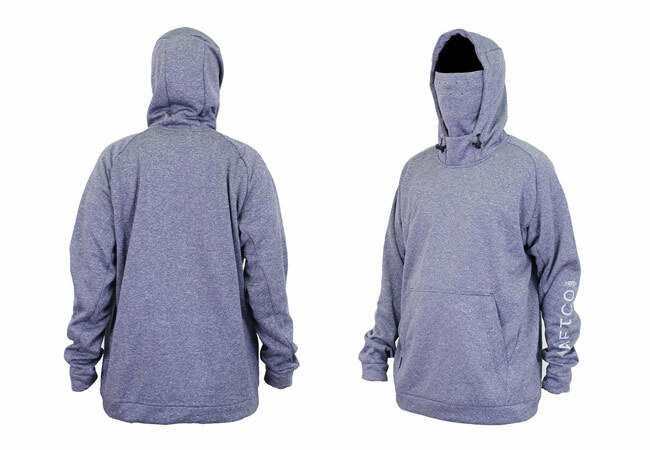 All of us rely on hooded sweatshirts for a variety of activities on and off the water. If you’re like me, you also have a number of neck gaiters, buffs and bandanas (but probably not dickies unless you’re really old school) – which will protect you from sun, wind, cold and rain, and also allow you to rob a bank on the way home from the lake to pay for more Senkos. While I’d previously owned a sun-shirt with a built in neck gaiter, until I got the AFTCO Reaper fleece hoodie, I’d never thought to combine the two to protect me from cold. And it’s not like they just went to the Wall-Mark, grabbed a $9.99 sweatshirt and slapped a ring of fabric where your shoulders connect to your noggin. This is a serious 21st Century piece of clothing, with ventilation in the mask and armpits, closures on the handwarmer pockets (so those Senkos don’t go flying out as you’re headed down the lake at 70mph), and a hood cinching device that tightens in all the right spots. The microfleece material is super-soft. It’s also stain-resistant, which is good for the Vienna Sausage dribblers among my readership. Most importantly, the sucker is comfortable. I’ve always resisted wearing turtlenecks and other limb-strangling devices for even a moment longer than necessary – there are even occasions that I’d rather be cold than constantly scratching at restrictive clothing – but this one is super-smooth and fits just right. I’m impressed. PRO TIP: If the temperatures aren’t likely to stay frigid all day, wear a long sleeved shirt under the Reaper. I don’t know the science behind it, but it’ll get you hotter than two rats fighting in a wool sock on a July day in Florida. When it gets over 50, you’ll want to take it off.